With this being my first Easter with you here at St Margaret’s, I thought I would share a bit of my own personal musical and spiritual journey with you by programming music I had the privilege to learn and sing during my time as a treble chorister at Saint Thomas Church Fifth Avenue, New York City. 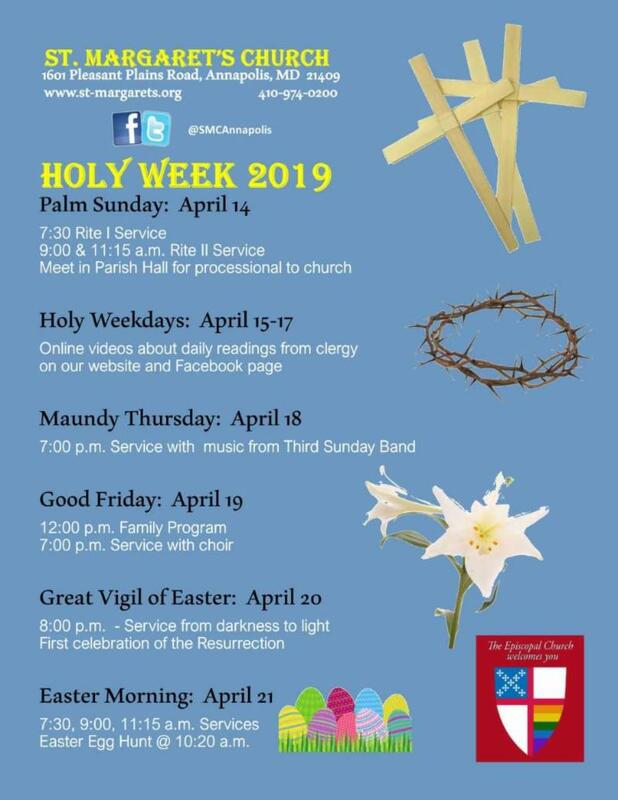 Among many fond memories of my time there were the numerous services we had to sing from Palm Sunday through Easter Sunday, including Palm Sunday, Tenebrae, Maundy Thursday, Good Friday, Easter Vigil, culminating in two Easter morning services and afternoon Evensong. After a week of eleven services, a much-needed vacation from church and school was well-deserved! 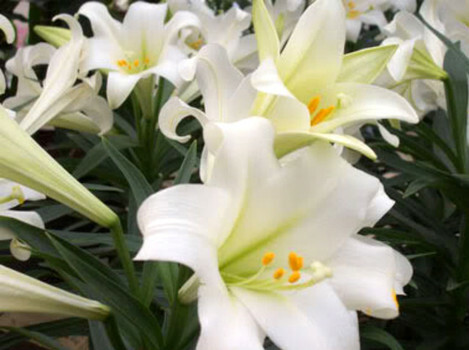 ﻿Among the musical selections for Easter Day here will include wonderful pieces for choir, organ, brass and timpani, and in particular, hymns arranged by my former choirmaster at Saint Thomas, the late Gerre Hancock, St. Louis-based American church musician Robert Lehman and the famous British conductor and composer John Rutter. 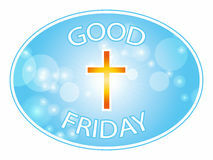 Click here to hear John Rutter’s arrangement of “Jesus Christ is risen today”, and click here for a full list of music for the day (and Holy Week). 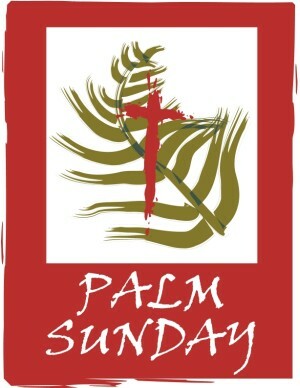 REMINDER--This Sunday is Palm Sunday! ﻿At the 9:00 & 11:15 a.m. services, all should meet first in the parish hall to receive your palms and bulletins from ushers and process to the sanctuary together as Jesus processed for his arrival in Jerusalem. 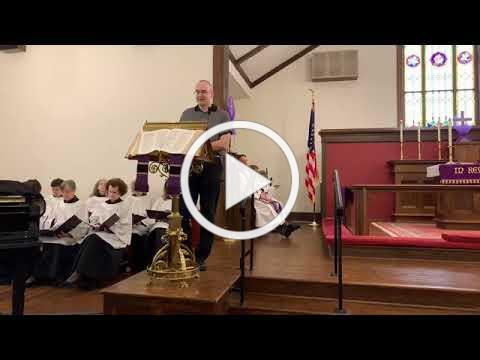 Our Holy Week videos with the Revs. Peter & Patti will be posted next Monday, Tuesday, and Wednesday at approximately noon on our Facebook public page and church website. 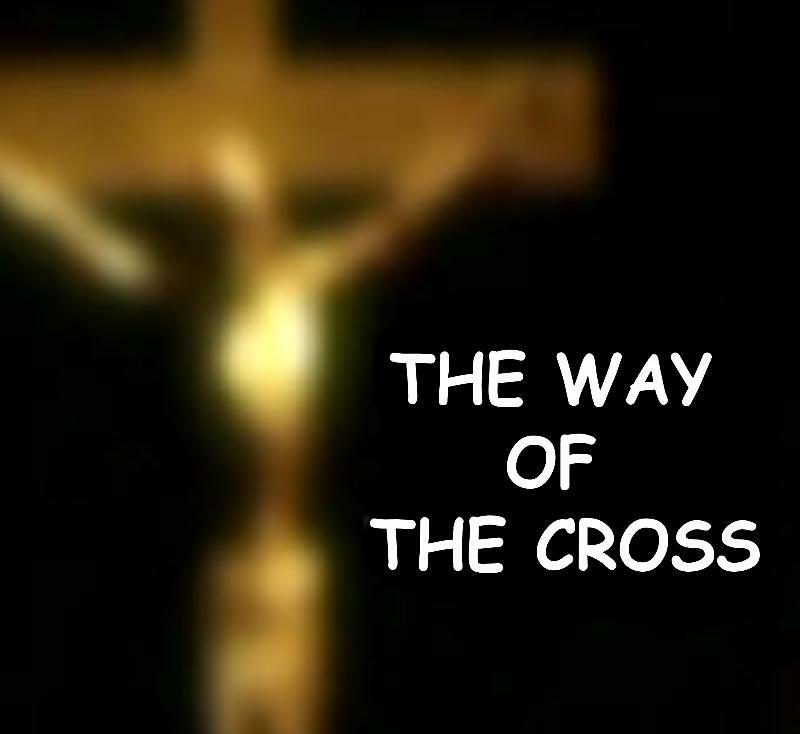 The story of Christ's crucifixion and the message of the resurrection are complex and can be overwhelming to younger children. 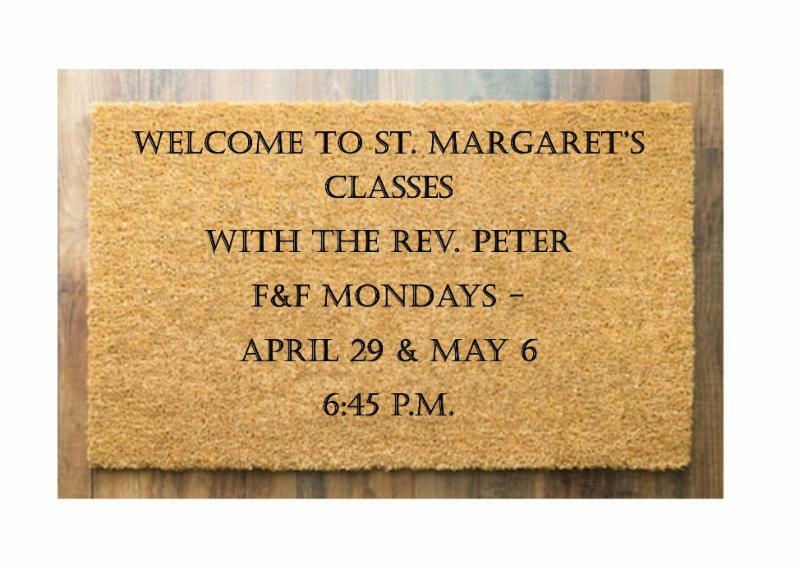 Families are encouraged to join the Revs. Peter and Patti as we journey through Jesus' story with interactive activities and dialogue that re-visit the concepts of the Easter story in a delicate and reassuring way. Find more information HERE . We are now soliciting donations of Easter candy for our annual Easter egg hunt for children to be held Easter morning during coffeehour. We need individually wrapped candies that do not have any nuts in them or are not made with any nut oils. You can leave donations in the designated box in the narthex. Donations needed BY THIS SUNDAY. Honor or remember a loved one this Easter and help decorate the campus for Easter. 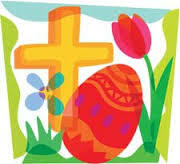 Purchase Easter flowers and your dedication will be listed in the Easter bulletins. DUE DATE IS THIS SUNDAY - April 14. 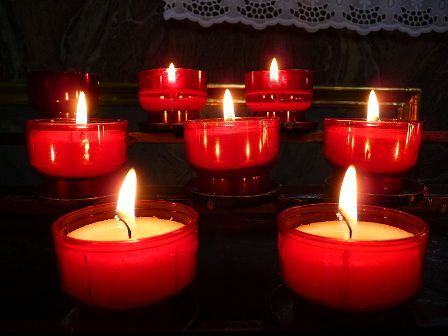 Our last Lenten compline service will take place this evening at 7 p.m. If you haven't yet attended, try to make tonight's. It's a short, contemplative candlelit service with all liturgy sung. 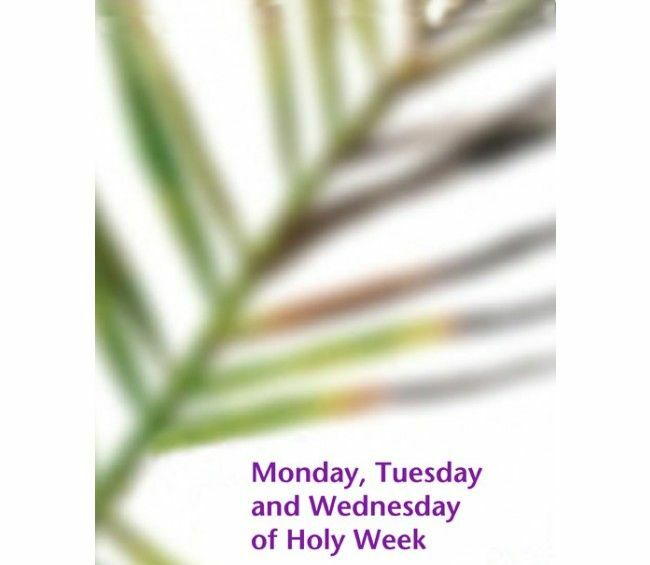 It will be the perfect way to observe the Lenten season and to close your day. Adult and youth volunteers needed! 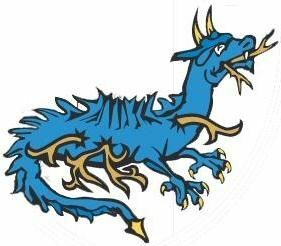 The St. Margaret’s Day School Board of Trustees is looking for a new Board Chair who will replace Susan Roberts at the end of her two consecutive terms this coming Fall 2019. 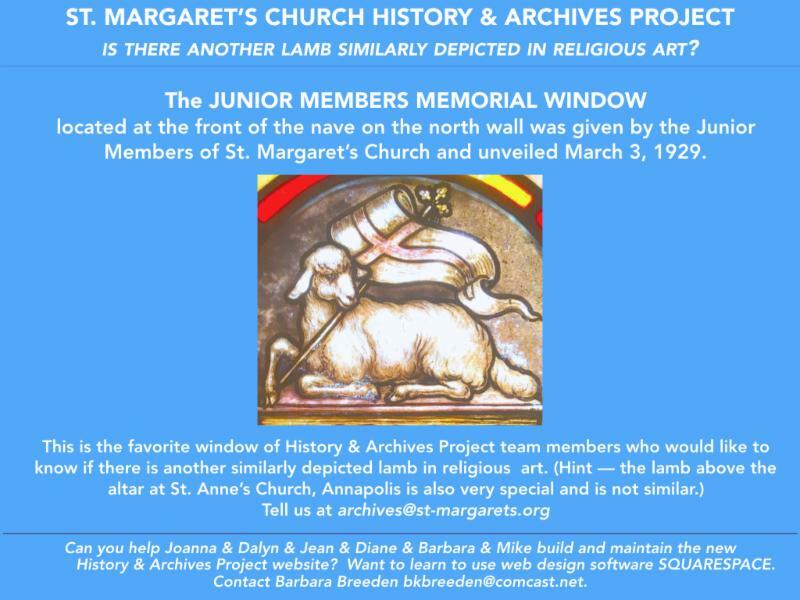 The St. Margaret’s Day School Board oversees the activities and affairs of the school. 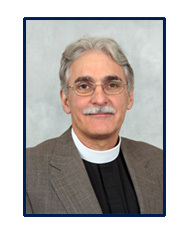 The Board Chair, a volunteer position, is responsible for leading monthly Board meetings, overseeing the finances of the school, presiding over the financial aid, nominating and executive committee meetings, and advising the Rector of St. Margaret’s Church in reviewing and preparing the annual contract for the Director of the school. The search committee is looking for a visionary to take the school to another level of programmatic excellence in partnership with the Director’s vision for the school. 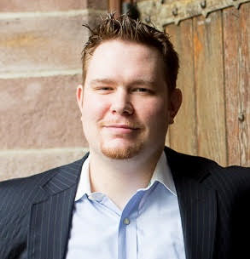 The ideal candidate would have a background in early childhood education or have strong roots in non-profit management, have an ability to advise on financial matters, have strong liaison skills and the ability to form successful partnerships between the church, school, and community through the development of active board committees. The next Board Chair will find that St. Margaret’s Day School is thriving under the current leadership and provides a wonderful opportunity to be involved in something truly special in our community. If interested or with any questions, please email Elizabeth Parker at dr.eparker@gmail.com . 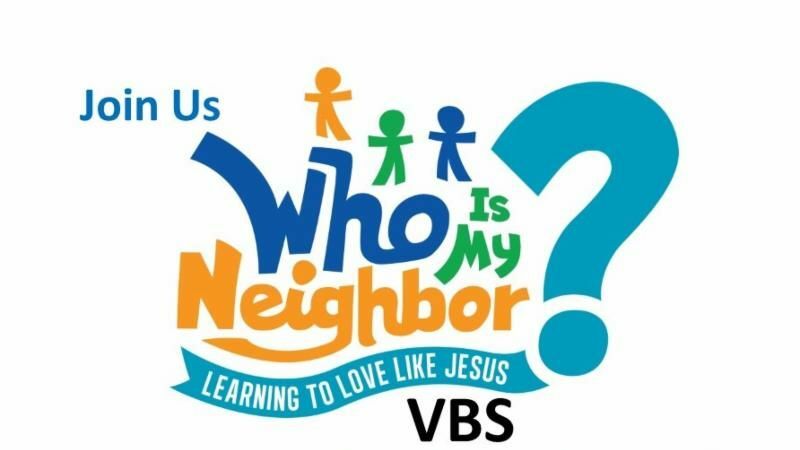 There will be no Faith & Fellowship programs/meal on April 15 and 22. There WILL be rehearsals for Spirit Singers & Youth Chorale as well as Youth Group on April 15th. 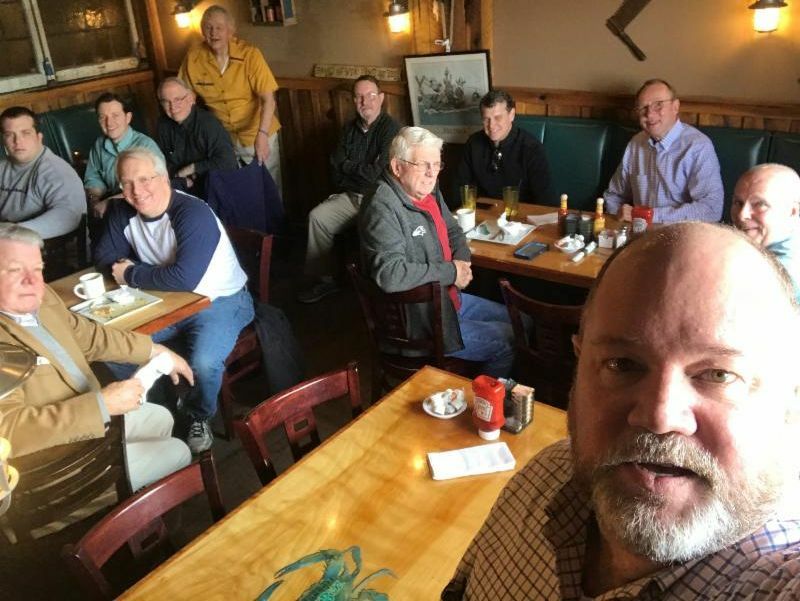 Thank you to all the parishioners who attended our Men's Breakfast on April 6th. Mark your calendar for our next breakfast to be held on May 18. 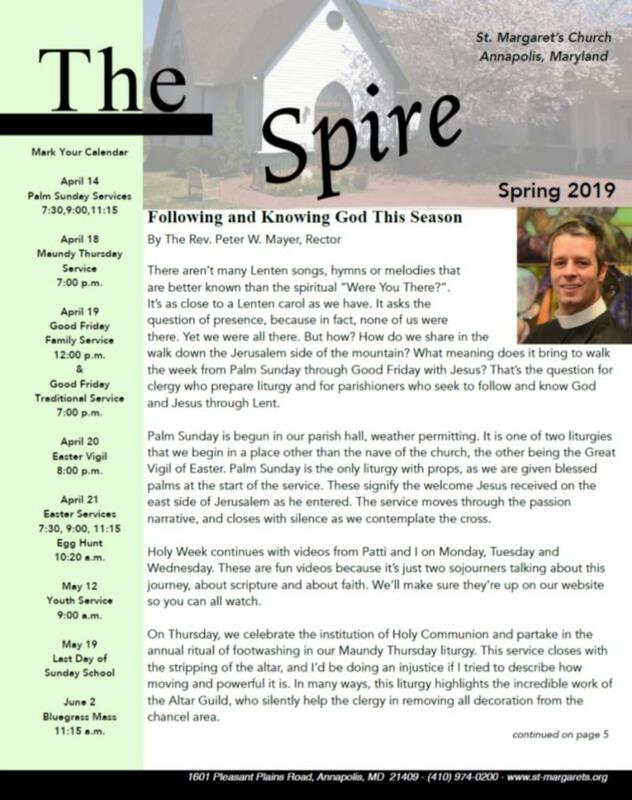 Join us on Sunday, April 28, as the retired Rev. Dr. Luis León, who mentored our own Rev. Peter W. Mayer at St. John's Lafayette Square in Washington, DC, visits St. Margaret's. He will be preaching at the 9:00 and 11:15 a.m. services. We will also have multiple Holy Baptisms that day so it will be a joyous day at St. Margaret's. All are welcome to attend the next monthly meeting of the Women's Guild as they spend an afternoon with Day School students including storytime and other activities Bring a bagged lunch at noon. Students should be visiting the Fellowship Hall around 1 p.m.
Join us during coffeehour on Sunday, May 5 as Rich Bowen, Recycling Program Manager for the Anne Arundel County DPW Waste Management Services, discusses the county's recycling program, what should and shouldn't be recycled, what happens to the material after the recycling center sorts it, and what could make recycling more effective in the future. Program will be from 10:30 to 11 a.m. The St. Margaret's Green Team will be screening "A Plastic Ocean" on Monday night, May 6, 6:30 p.m., as part of our environmental film series. Our youth have been hard at work planning a service they will lead at 9:00 a.m. on Sunday, May 12th. Please plan on attending and supporting our youth through their faith journey. 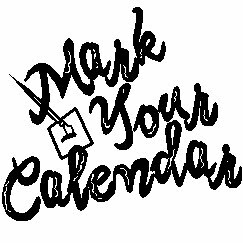 The Spring Foyer Social is scheduled for Sunday, May 5 from 3-5:00 pm in the Parish Hall. Please mark your calendar and plan to attend. Please bring an appetizer or snack. At this meeting, we will ask each Foyer Group Leader to share the experiences of the group, highlight what worked well; lessons learned this past year, and new ideas for the Planning Team to incorporate in next year’s planning. We hope to see you there.  If you participated in this year’s Foyers, you need to do nothing. Your name will be included in the groupings and you will be assigned a new group in September 2019. If you are new to the experience and wish to be included, please send you name to Vera Torrence at vdtorrence@verizon.net. Also, if you want more information about the Foyers, you can talk with one of the four members of the Foyer Planning Team. Their names and emails are below. There is new leadership for next year. Web Chamberlain has agreed to assume a role of leadership for the planning and execution of the Foyers. Web has contributed much to the Foyers for 2019. Karen Engelke and Vera Torrence are stepping down from this role to pursue other opportunities. Arvilla Wubbenhorst and Lesal Kilcrease will continue to serve on the Planning Team. However, Web needs additional leadership and new participation. The event is not demanding and requires work to organize and communicate but once the season starts there is very little required. If you wish to talk to one of us about our experience, please check with the four of us who served for the past year. If you are interested in assuming this role, please contact one of the members listed below.